Thank you. Georgia was a character -- that's for sure. She had a very assertive personality. She was one of a littler of four we took in as kittens. She is survived by her remaining sister, Paloma. Bless her, and you for having them all. She and her sister lived long for cats, I think, and I am sure they were really happy. Oh, I'm so sorry you've lost your cat. She looks like a lovely cat, too. Condolences. Thank you. We're down to five now. It seems to empty. I'm truly sorry for your loss. She sounds like an amazing furry person. Thank you. She was the alpha female around here for sixteen years. I hope poor Paloma has a little time to enjoy her place in the sun. That's always so hard, to lose the companion of years. You have my sympathy. Thank you. She was a 'presence'. I too lost one of my four 2 weeks ago and I certainly know how painful and empty it feels. I'm sorry for your loss too. It will take a long time for that 'missing piece' feeling to go away. My condolences for your loss. It is always hard to lose a beloved cat, and especislly when you had her for so long. At least, she had a grand old life! Yes, she had a good life and a long life, considering that our friend called us the night they were all born saying, "The kittens are here. How long before I can take them to the pound?" We agreed to take two of them, as a reward to my son for maintaining a 4.0 GPA, but that turned into four the night we picked them up. I have never regretted it. "The kittens are here. How long before I can take them to the pound?" Ouch! That was an incentive to take them in if I ever heard one! Did the pound in question have a no-kill-policy or ould they have been killed if you had not taken them in? That is a fun photo! What a wonderful memory. 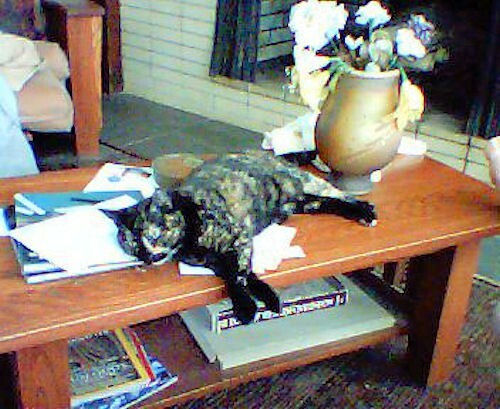 Unfortunately, it exposes how messy my coffee table was back in those days. I think that's my son's schoolwork she's lounging on. It was also before I had a decent digital camera, and the resolution on the photo is pitiful. But she didn't look a day older, even all this time later. Actually, I like both of those factors--the less than perfect resolution and the messy, homey look to the scene. So sorry for your loss. My condolences, sir. She was a lovely one. She was beautiful, and she didn't look much different, ten years (or more) later than that photo was taken. We were not expecting to lose her so soon. Thank you. I've trod the road more times than I can count, unfortunately. But the 'special cat' who belongs only to you and merely tolerates every other person in the family comes along only a few times in a lifetime. Georgia was Buns' special cat. I'm feeling doubly grieved.